Slab then freehand numbers. 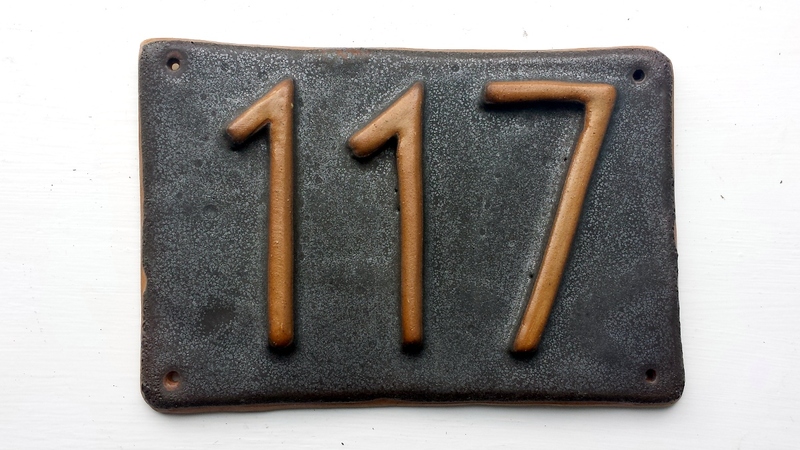 Love the toastiness on the numbers from wiping away the matte black glaze. Another experiment in thinning out – it’s nice and thin. 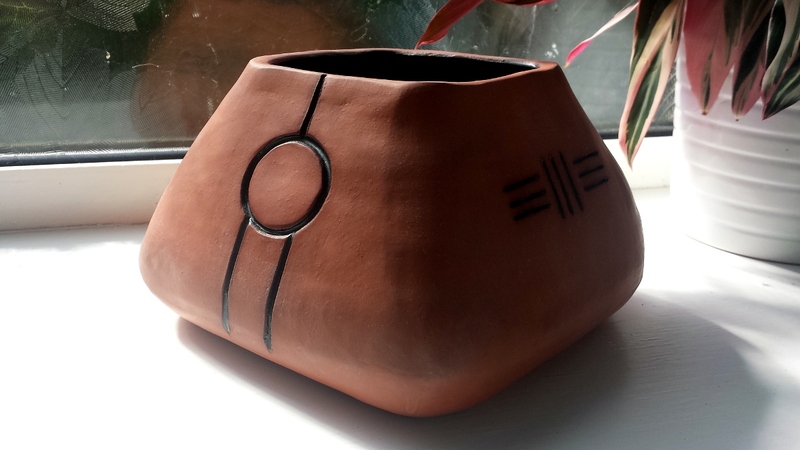 The pot has drainage holes in the bottom, hence the saucer. 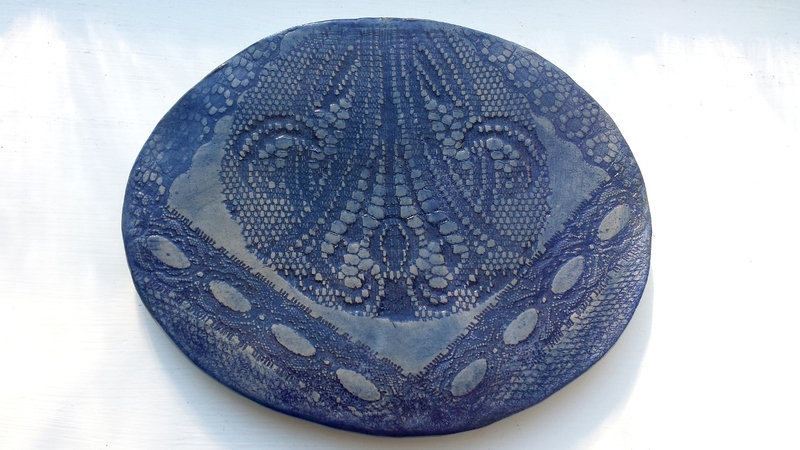 The idea was the outside of the pot and saucer should have been matte black (slip), with a shiny blue glaze inside, around the top (on an angle) and in the saucer. 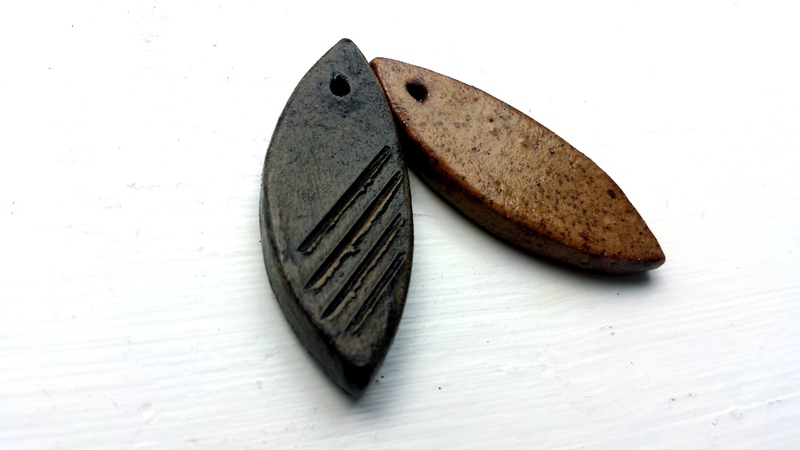 For some reason, the black slip came out brown and on the outside, the glaze went … beigey? There is more blueness inside but not a lot. Not sure what happened but I think I like it better this way anyway! Someone else at Hive is fantastic at making little walls and I decided to copy – his are far, far better than mine. It’s inspired by the walls in the woods near our house – which have inexplicable doorways that have been blocked up, and are rather tumble down in parts. (The smaller section is supposed to have “logs” tidied to its collapsed section, like a particular bit in the woods, but I haven’t done it.) I think my main problem with this was making it in spare/rushed five minutes here and there – the “bricks” (which are all individual) are inconsistent and got a bit bendy, and while I wanted soft, age-worn edges, they ended up a bit round. Still, it was one of my first out-of-my-comfort-zone projects in drop-in, so I like that it helped me pick up my game. 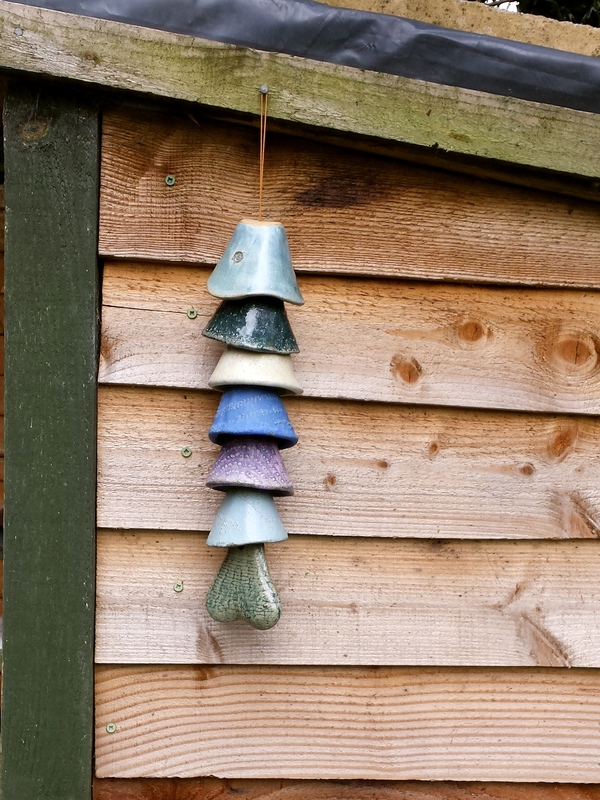 I’ve already blogged about this one – some little slab-built pots for testing textures/glazes, which come together to make a fishy wind chime thing. 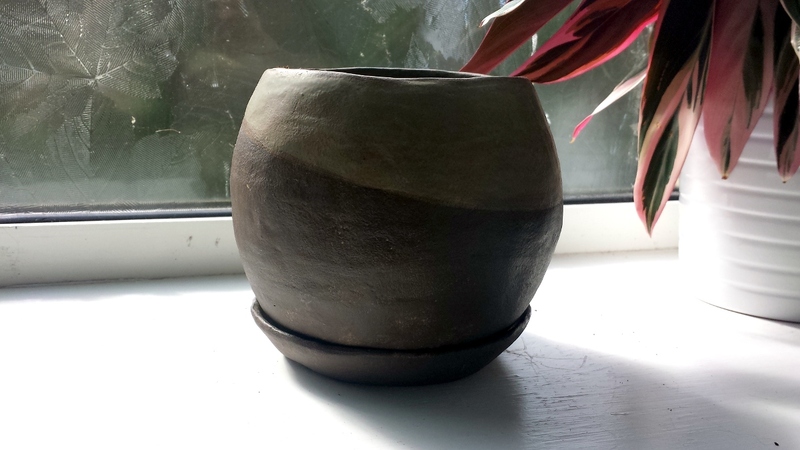 Every bit of it was trying something new – from building pots with slabs, to working out a way to stop me hating the grogged clay (burnish it smooth), to texture application, to glazes. It’s far from perfect but it was very useful indeed. An assortment of buttons. Made quite quickly and imprecisely, but I quite like that they look worn. They’re fiddly little blighters to glaze, I don’t imagine I’ll make more in the near future. 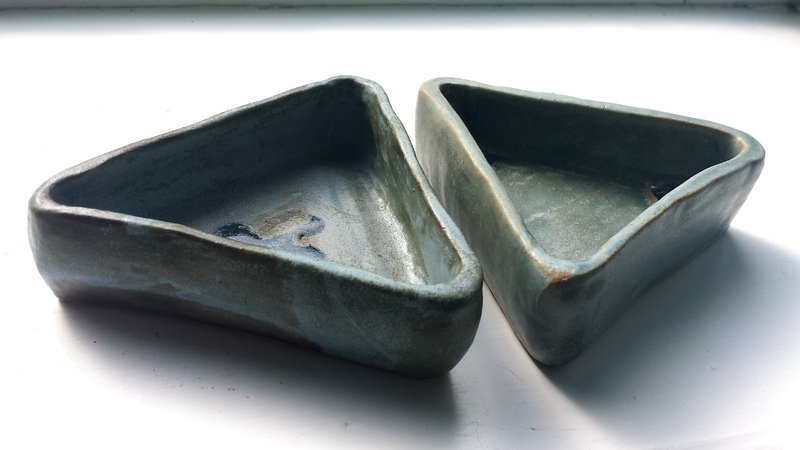 Two small ashtrays – made for our friends, but I’ve commandeered at least one for collecting my thread/yarn ends ;) Slabs with coiled sides. The left one has curved sides, the right one straight ones – just for a bit of variety. Also testing different glazes – though the extra glaze I tried to put inside (the shiny stuff) didn’t work at all all (which is a shame because otherwise they’re glazed well). 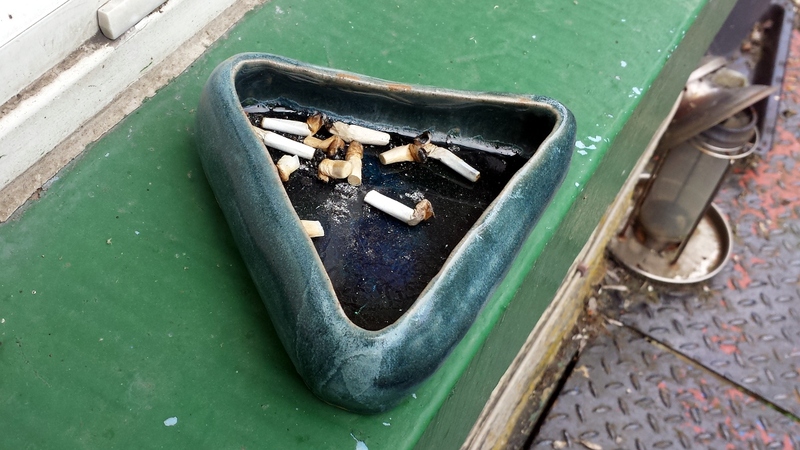 The third ashtray in the set has already been put to use (it lives on our balcony for our smokey-joe friends to use when they’re here) – sorry for the gross butts but I’m lazy and couldn’t be bothered emptying it for the pic ;). 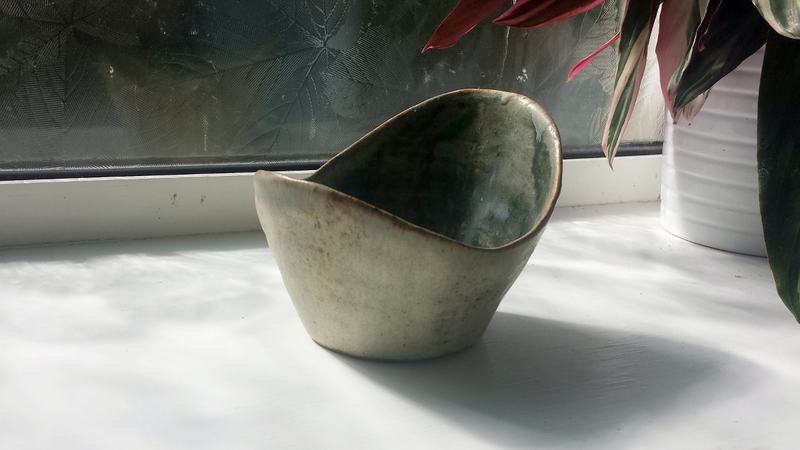 It’s got a layer of melted glass in the bottom – but because I’d used a dark glaze, you can barely see it. A shame because it’s got some nice swirls/colour variations in it. 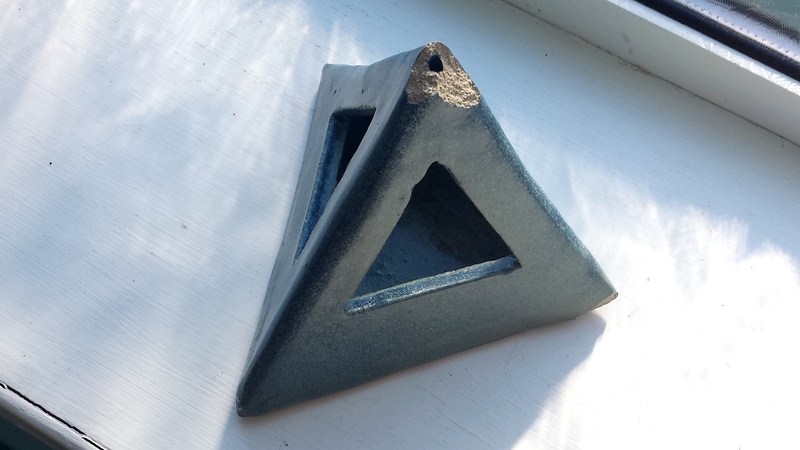 From my “ceramics for outdoors” class. Slab built. 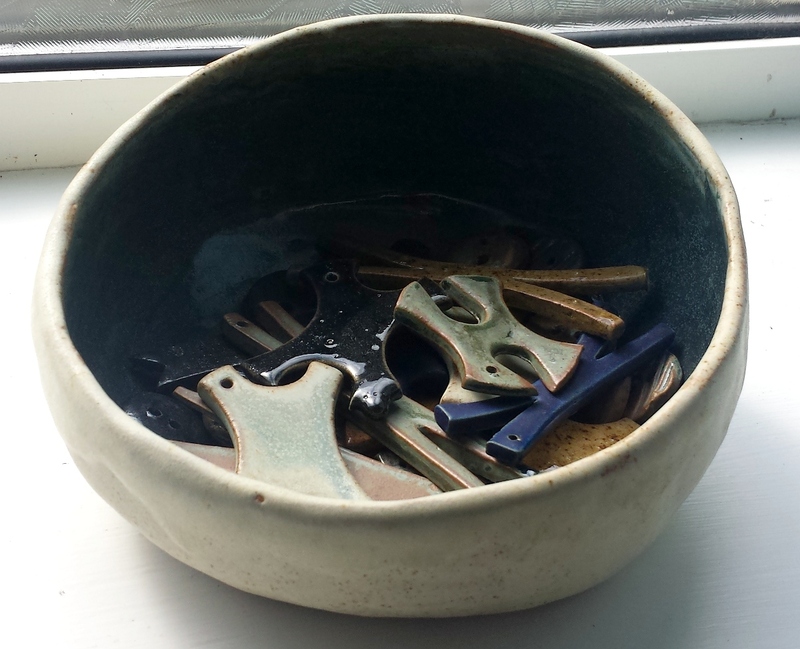 It should have been a marbled grey-blue glaze (like the little ashtray on the left) but it came out a speckled blue (possibly due to an overfiring kiln). Strange-cat knocked it off the window sill the other week, hence the broken apex but I got to see my joins were strong – can’t see where the slabs meet. Coiled and made holey. Instantly regretted the bigger holes but other people say they like the variety. 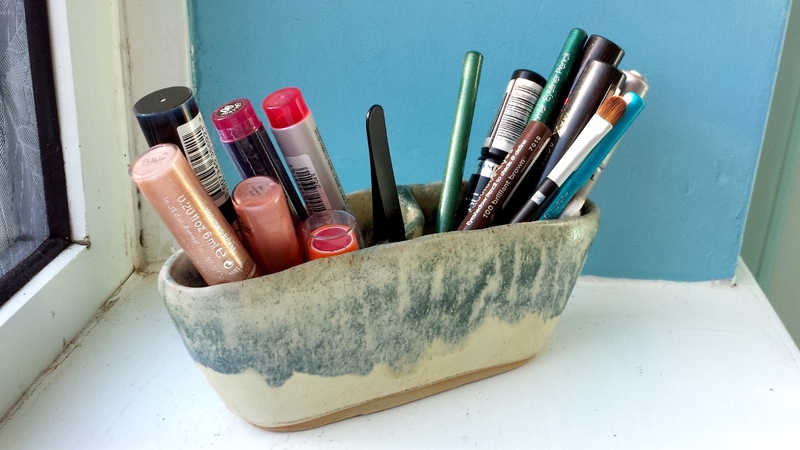 The same glaze combo as the make-up pot, though with more of the shiny teal on top. The glaze ran a bit so there is a little kiln shelf stuck to the bottom but nm. 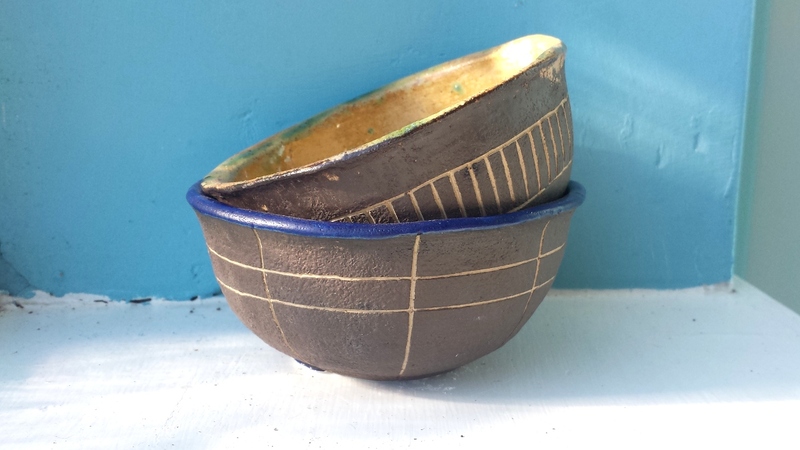 Two little bowls, coiled very quickly into a mould, to practise sgraffito – (“painting” the outside with coloured slip then) carving into the surface of the clay. 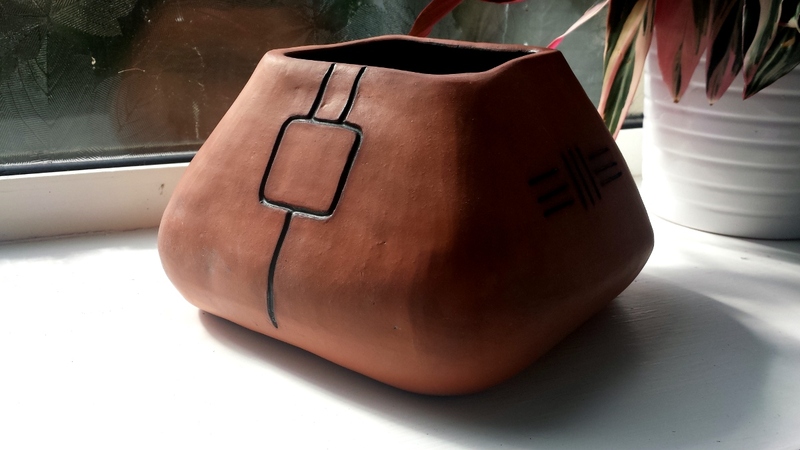 This was my first attempt at sgraffito and it went well – and put me on my current path of geometric/line-based carving. It’s a shame the build quality let them down – the bottom cracked on one and the rim broke on the other. The latter was fixable but I didn’t realise how much it had smudged the coloured slip so it’s a bit scruffy now. I tried fixing the cracked bottom with glaze and glass but that just made the problem worse. Nevermind, lesson learnt! 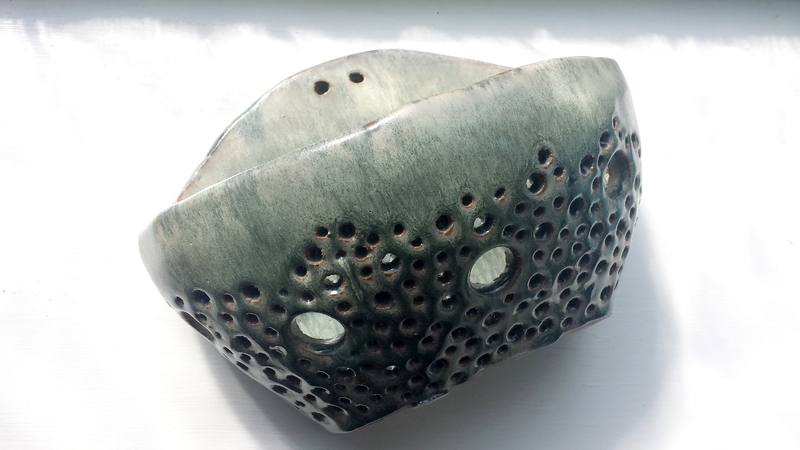 The grey colour should be black, don’t know why it stayed grey (possibly not fired hot enough for the oxides to change colour?). I’ve done two batches of these – the second long one from the left is from the first batch, the rest are from the second. The first batch were glaze testers (trying out different colours/finishes) but once I found how enjoyable they were to use, I made some more. (The rest of the first batch are in use, wrapped in embroidery threads.) I got a bit more creative with shape and glaze on the second batch – they didn’t quite turn out as planned but will get used all the same. 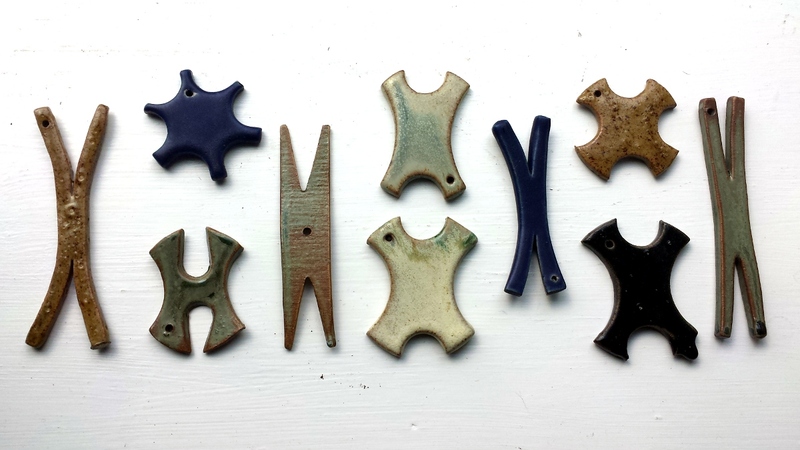 The offcuts from some of the thread winders: more glaze experiments really. This was supposed to go from square to round, but it went from square to… slightly off square instead. Base slab into a mould, then coiled. 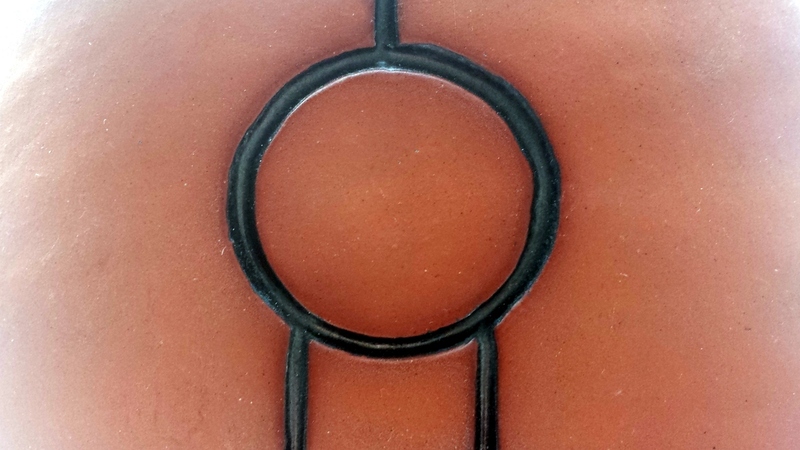 Shaped and burnished, then carved – circle with lines on one side, square with lines on the opposite side, and matching groups of lines on the other two. I worked on getting the rim right for a long time – it’s still not perfect but stronger than a lot of my coiled bowls. 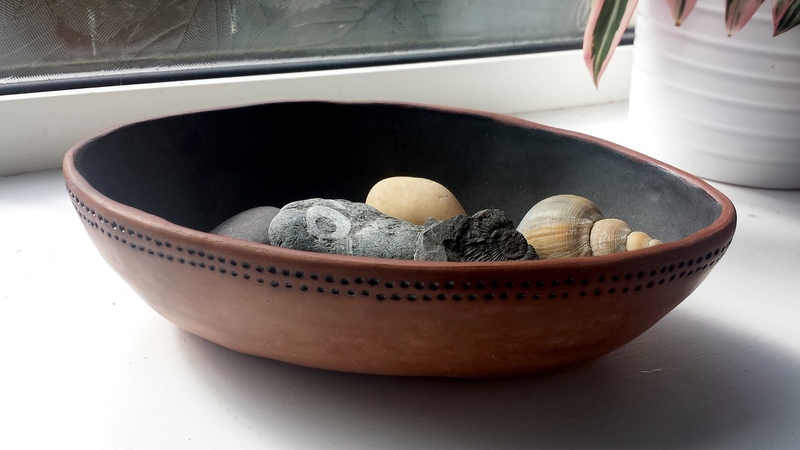 Love the carving, especially once picked out in black glaze (there is a matte black glaze inside too). There are a dozen ways I’d improve it but I very much like this piece. 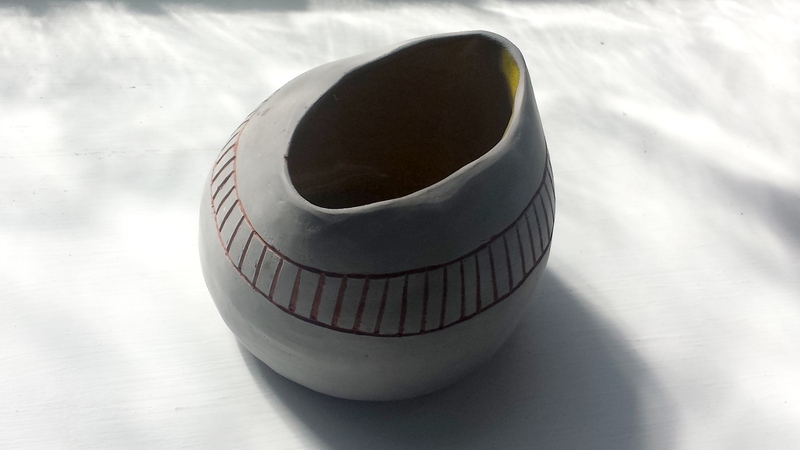 Coiled into a mould – it was supposed be round but got squished… Coloured (black) slip and carved again, then “speckled yellow” glaze inside. The outside should have been black, giving a good yellow/black/red clay contrast but as with the runes above, it didn’t change colour. (I didn’t put any clear glaze on in case that was the problem – but apparently not.) I like it but the colour is disappointing really. 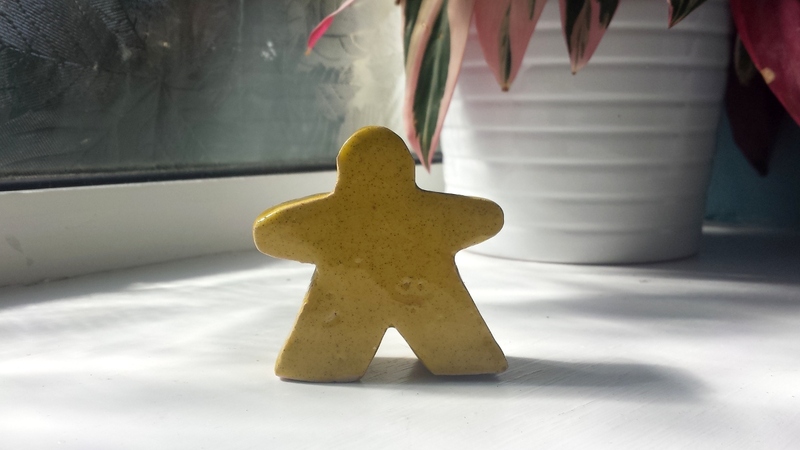 I made a family of meeple as part of my raku course – but decided to fire this one conventionally, in the same earthenware “speckled yellow” glaze as the above pot. (The glaze had settled solidly, I had to stir it for an hour before I could use it so I wanted to use it for more than one thing!). I like him – but can’t wait to see his bigger, raku siblings. 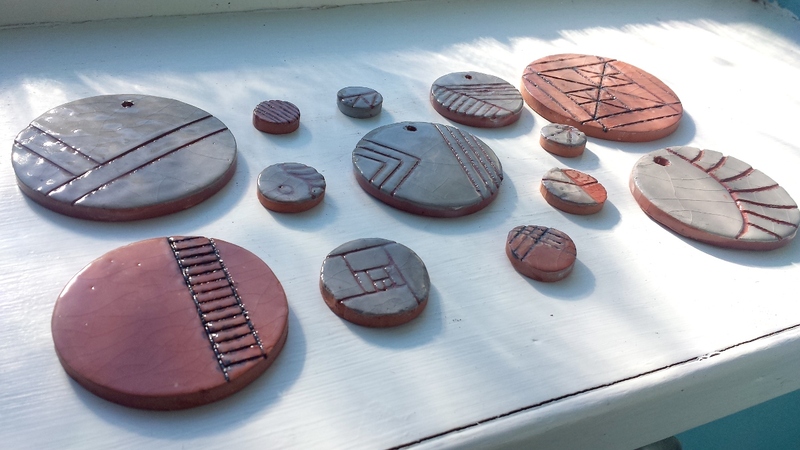 I’ve currently got a few things waiting for their final firing in the kiln, and a whole load of figurines (the rest of the meeple & some ancient-style animals) and a couple of bowls which should be raku fired in the next fortnight (and a terracotta pot for smoke firing). I’m also working on a couple of things that are very “not me” – lots of random textured slip — which makes a nice change.